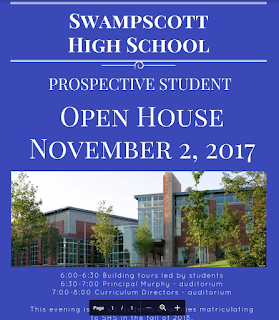 November 2 is our evening for prospective students. This is geared towards families that are investigating private school options or currently attend a private school but are interested in transferring to Swampscott High School next fall. In the spring we have an evening for parents of grade 8 students that are attending SHS. Girls Cross Country shut-out Salem 15-50 to move to 4-2 overall and 4-1 in the NEC South. Rounding out the top 5 spots were Caroline Kinne, Clara Harrington, Leonie Flacke, Elizabeth Green and Gigi Dishman. They race this weekend at Franklin Park and close out the regular season on Tuesday vs Medford at Medford. Boys Country Team defeated Salem 23.5-35.5 to move too 5-1 overall and 5-0 in the NEC South. Rounding out the top 5 spots were Pat Doucette, Evan Lippman, Will Fraser, Will Fuller and Reece Klusza. The boys will compete Saturday at Franklin Park and on Tuesday vs Medford at Medford closing out the regular season. If they win Tuesday the boys will secure the NEC South Title. Volleyball had a very good week playing 3 matches and winning them all. Monday we faced off against Somerville at Somerville in a tough match that started out with us losing the first two sets. Never giving up the Team rallied back to win the next 3 sets to take the match 3-2. We then faced Saugus at Home on Wednesday and had total control, winning 3 quick sets. Then Thursday night another home game against Lynn Classical where again the Team took total control of the match and won 3-0 again improving our Record to 8-6. Haley Bernhardt had a great game and one that kept the defense from Peabody in check. A great game was also had from Sydney Clark in the middle of the field where her big presence denied the quick midfield line from Peabody to get too comfortable. On Thursday, October 19: Swampscott 7 at Somerville. Haley Bernhardt had a fantastic game. Her performance got her to the top of the NEC scoring table. Also with an excellent show was defender Kayla Kornitsky who managed to make key stops to help goalkeeper Fiona Herring pick up another shutout. At midfield, Grace DiGrande displayed great hustle and decision making that allowed for Bernhardt to be set up nicely for scoring opportunities. Boys Soccer had a very busy week with four games. Able to pull off a win against Saugus, Big Blue added a win to their season. With three close games to close out the week, our boys were unlucky against Revere, Medford, and North Andover. We kick off the new week against Beverly at home on the 23rd. Big Blue Football defeated Saugus 40-19 this Saturday afternoon. Great effort from all. Outstanding efforts from the offensive and Defensive line play. The offensive line allowed Frary to throw for 370 yds. in 3 quarters and the Defensive line allowed only 7 points before we changed them out. This Saturday starts a new season and the playoffs. Saturday at our place @ noon vs. Watertown.